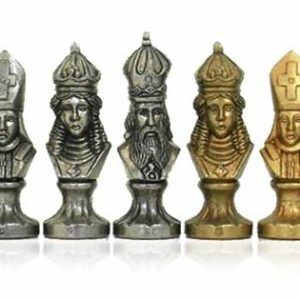 King Arthur's Camelot unique chessmen set by Italfama Made in Italy. Size : King h 3,5″ and Base h 1,14″. Material solid cast medal. Brass and nickel finished. The base is in natural wood. This is Camelot, it is the castle and court associated with the legendary King Arthur. Absent in the early Arthurian material, Camelot first appeared in 12th-century French romances and, after the Lancelot-Grail cycle, eventually came to be described as the fantastic capital of Arthur’s realm and a symbol of the Arthurian world, now is the field of a great collection of chess men, the chess men of a King, King Arthur. King Arthur, the legendary British leader who, according to medieval histories and romances, led the defence of Britain against Saxon invaders in the late 5th and early 6th centuries. The legend details of Arthur’s story are mainly composed of folklore and literary great stories that you can relive with this unique chess men.